To change how your view is sorted, click , or pull down the View menu and click Sort Roster. Note: All reports are printed in the order in which the roster is sorted. You can sort the view by any items you are currently viewing on the screen. And since you can change what you are viewing on the screen at any time by clicking the View menu and selecting Custom Views, this means you can sort the view by any item the program tracks. Select the items to sort by. Also select the sort order (A to Z, 1 to 9) or (Z to A, 9 to 1). Click OK to sort the golfers. Note: HS can sort by 1, 2, or 3 items. 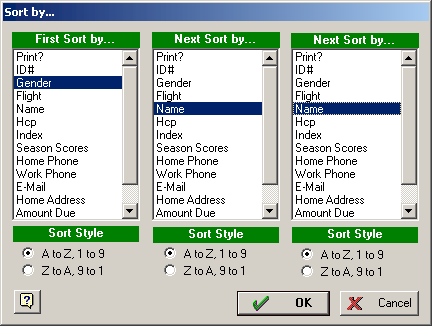 In the above example, golfers will first be sorted by gender, then they will be sorted by name. Note: All reports are printed in the order in which the roster is sorted.